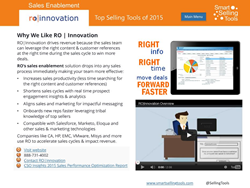 RO Innovation, the leader at activating the voice of your customer in B2B Sales and Marketing cycles, is pleased to announce its inclusion in the Sales Enablement category of Smart Selling Tools Top Sales Tools of 2015 guide. This annual buyers resource is designed to help B2B companies discover, assess and choose the best Sales software available on the market. The 2015 guide organizes Sales tools into 14 different tool type categories, and provides a multimedia experience to learn about each of the tools selected this year. DEUTZ Corporation is pleased to announce the recipients of its 2014 Distributor Awards. Each award was presented last week, at DEUTZ Corporations annual Distributor Meeting. The meeting was held this year in Montego Bay, Jamaica. Dave Combs, Vice President of Distribution noted, It was appropriate for us to present the awards at this particular Distributor Meeting, since the theme was Powered by Partnerships, and each recipient serves as an outstanding example of a strong partner. Steve Corley, Chief Sales Officer for DEUTZ Corporation noted, We were very pleased to recognize these four outstanding distributor partners during our Distributor Meeting. DEUTZ engines were re-introduced to the North American market in 1951 by Diesel Energy Corporation, which later became a DEUTZ subsidiary in 1955, and its name was changed to DEUTZ Corporation in 1974. DEUTZ Corporation, a subsidiary of DEUTZ AG, is a sales, product support, parts, training, and application engineering center for the Americas, supporting the DEUTZ product range of 30 700 hp diesel and natural gas engines. 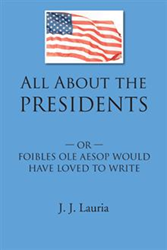 Author J.J. Laurias 2009 collection of entertaining stories, All About the Presidents: or Foibles Ole Aesop Would Have Loved To Write (published by AuthorHouse) will be on display at the 2015 BookExpo America, which will take place at the Javits Center in New York City from Wednesday, May 27 through Friday, May 29. In All About the Presidents, Lauria feigns seriousness in his display of Faction a combination of fact and fiction while discussing past U.S. presidents fictional foibles made to seem not only possible but also plausible. Laurias well-intentioned humor does not descend to slapstick, but rather provides a means of pressure release from the cynicism over the judgment and behavior of occupants of the nations highest political office. Lauria attributes the fictional foibles in his book to the memories entrusted to him by a mysterious man known to him only as Hershel Foible or Al Zimer (pronounced Alzheimer). Lauria hopes Mr. Zimers accounts will entertain while simultaneously providing the barest framework of fact about past presidents, playing on the publics appetite for news about the behavior of the nations leaders. 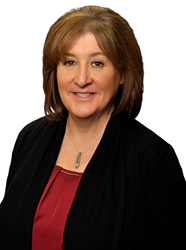 Five Star Professional is pleased to announce Nicky Hungerford, Universal Landing Corporation, has been chosen as one of Denvers Five Star Mortgage Professionals for 2015. Five Star Professional partnered with 5280 Magazine to recognize a select group of Denver area mortgage professionals who provide quality services to their clients. Nicky Hungerford is featured, along with other award winners, in a special section of the September issue. I am overjoyed on being selected as a Five Star Mortgage Professional for yet another year. I am blessed to be able to help new homeowners achieve the dream of homeownership. I have helped hundreds of families reduce their mortgage payment and remain in affordable housing. Thank you so much to my clients who continue to refer me and trust me with the precious decision of home financing. To my Realtor partners, I include you in my success and thank you for trusting your clients with me, states Nicky Hungerford of Universal Landing Corporation. 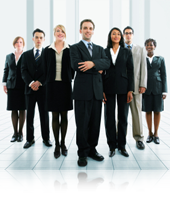 The Five Star Mortgage Professional award program is conducted in more than 40 markets throughout North America. Mortgage professionals are measured using an objective, in-depth research methodology with significant focus on customer feedback and overall satisfaction. We aim to uncover the best mortgage professionals across the country. To ensure that we recognize those with the highest of standards, we go to the source we gather client feedback and use a rigorous research methodology to evaluate candidates and determine qualified winners, Lynn Hargreaves, VP, Research and Services Operations, Five Star Professional. Nicky Hungerfords Five Star award profile can be viewed here. Five Star Professional contacts thousands of homebuyers to identify candidates and measure their client satisfaction levels. Phone, mail and online respondents rate their mortgage professional on criteria such as overall satisfaction and referability. Candidates are also evaluated on objective criteria including experience, production levels and disciplinary and complaint history. Mortgage professionals do not pay a fee to be considered or awarded. For more information, visit http://www.fivestarprofessional.com. Five Star Professional is pleased to announce Karen Abeyta, Keller Williams – Kansas City North, has been chosen as one of Kansas Citys Five Star Real Estate Agents for 2015. Five Star Professional partnered with KC Magazine to recognize a select group of Kansas City area real estate agents who provide quality services to their clients. Karen Abeyta will be featured, along with other award winners, in a special section of the July issue. Being among the few selected for the 2014 Five Star Real Estate Agent Award fills me with immense gratification. Yet, I am reminded that this moment of recognition is only possible because of the wonderful people who make up my clientele. This award is sincerely dedicated to our time together. says Karen Abeyta of Keller Williams – Kansas City North. Our list of local Five Star Real Estate Agents can be an invaluable resource for anyone looking to buy or sell a home. These agents are exceptional in their field and their commitment to client satisfaction; and are right in your backyard, Dan Zdon, CEO, Five Star Professional. Karen Abeytas Five Star award profile can be viewed here. Most investors have, at some time in their lives, borrowed money to complete a real estate transaction. Generally speaking, they have not had the opportunity to sit on the other side of the desk and be a lender. But, private lending (http://summerlinam.com/) gives investors the ability to loan money secured by a real estate deed of trust, or mortgage. This promissory note or trust deed is a qualified investment through a self directed IRA pursuant to IRS tax laws. The investment is made up of two parts: a promissory note and a deed of trust. The trust deed is a document that provides the collateral for the promissory note. It is filed with a county recorders office indicating that there is a loan against a property, creating a secured lien. Trust deed investing offers an unusual combination of high returns and consistent cash flow with a secured investment. Investors receive monthly interest payments on invested capital just as they would with a fixed income investment or money market fund. Trust deeds also offer a vehicle for investing in real estate without the need to manage property. Its an excellent way to diversify a portfolio. Plus, unlike publicly traded real estate related securities, such as REITs trust deed investments are straightforward and easy to understand. Jim Stepanian the CEO of Summerlin Asset Management stated, 2015 is a perfect time to invest in 1st trust deed mortgage notes because the price of real estate has normalized, thus mitigating risk. Many investors do not realize that investing IRA money in private 1st Trust Deed Mortgage Notes (http://summerlinam.com/) is perfectly legitimate, and has been since 1974, when the IRA code was first written. If the thought of investing in real estate if of interest, without the hassles of dealing with tenants and repairs, then perhaps investing retirement funds in trust deeds or mortgage notes may be something to consider. Using a self directed IRA to invest in trust deeds or mortgage notes can be an attractive option because it allows the ability to earn tax free, passive income in a secured lending arrangement stated James Stepanian the CEO of Summerlin Asset Management. A trust deed or mortgage note is a financial agreement between a borrower and private investor in which the promissory note is backed by a deed of trust recorded on the property. The borrower executes a note payable to the IRA owner and promises to pay a certain interest rate on the loaned money, plus repay the principal amount within a specific time frame. The monthly income from these payments may generate a higher-yielding return to your IRA in the form of monthly income. In the event the borrower defaults on their loan obligations, the IRA receives claim to the property once the property goes through foreclosure. But, while all investments involve risk, trust deeds or mortgage notes may offer an IRA owner the opportunity to recoup a portion or all of their original investment through the sale of the property. IRA funds are typically invested in public stocks, bonds, mutual funds and money markets, but can also be invested in Real Estate, Trust Deeds, Mortgages, Promissory Notes and Private Stock/Bonds. It can be very lucrative to purchase your best and safest investments with IRA funds to avoid income and capital gains taxes. This works especially well with a large amount of money in an IRA account(s). Summerlin Asset Management seeks to generate attractive risk-adjusted returns through investments in collateralized first position mortgages. Their management team executes this strategy by combining a sophisticated valuation analysis, pricing discipline, and professional mortgage workout solutions that benefit the borrower and Summerlin. For more information about purchasing first trust deeds with your self directed IRA please call 928 854 7747. Call Summerlin today and start earning double digit returns. The insurance industry saw a modest increase in employment with the addition of 4,200 jobs for the month of December, according to the latest employment numbers from the U.S Bureau of Labor Statistics released on January 9, 2015. The insurance industry grew by 0.17% last month and now sits roughly at 2.47 million employed insurance workers. In 2014, the total number of employed insurance workers has increased by 69,300 jobs. The BLS also revised its earlier figure of 10,100 new insurance jobs for the month of November to 11,000 jobs. The finance and insurance industry as a whole saw an increase in employment with the addition of 5,200 jobs for the month of December, despite several sub-sectors experiencing job losses. Across all industries, total nonfarm payroll employment increased by 252,000 jobs in December with job gains in professional and business services, construction, food services and drinking places, health care, and manufacturing. Unemployment decreased by 0.2 percentage points to 5.6 percent while the number of unemployed persons declined by 383,000 to 8.7 million. Across 2014, the unemployment rate and the number of unemployed persons were down by 1.1 percentage points and 1.7 million, respectively. Employment numbers were revised for both October and November, from 243,000 to 261,000 jobs and 321,000 to 353,000 jobs respectively. With these revisions, employment gains for both months combined were 50,000 more than previously reported. CATONSVILLE, Md. It may have all happened a long time ago, but the wounds of the past are slow to heal. Just recently, a former prison guard at the Nazi death camp in Auschwitz is being tried in Germany for having allegedly volunteered for the job. 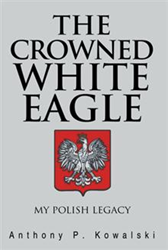 In light of this, author Anthony P. Kowalski takes readers back in time with The Crowned White Eagle (published by Xlibris), which traces the history of the Polish people, their trials and tribulations. This book features the tribulations experienced by Poland during World War II. Capturing the essence of a crucial time in Polish history, it is written to stand as a symbolic reminder of the countrys tenacity, endurance and unwavering spirit that surpass all forms of atrocity. In looking into the countrys tumultuous past, Kowalski shows that even though two centuries of violence, misery and crimes to humanity may have torn down families and taken the lives of many citizens, it never took away the peoples hope, for the aspiration for freedom and democracy prevailed continuously within the hearts of the valiant Polish people. This is a unique testimony to a forgotten people, says Kowalski. In expressing the Polish peoples plight, The Crowned White Eagle echoes the struggles of many ethnic and religious minorities around the world. It is his intent that this book would give readers the courage to stand up for their ideals and inspire them to work against oppression of every stripe. Anthony P. Kowalski is a native of Trenton, N.J. He studied at St. Marys College in Orchard Lake, Mich. (BA, 1957) and Immaculate Conception Seminary in Darlington, N.J. (1957-61), then did graduate work at Fordham (MA Latin, 1966) and NYU (PhD Ed Admin, 1977). Ordained a Catholic Priest for the Diocese of Paterson, N.J. (1961), he served for fourteen years as associate pastor, teacher and seminary rector. In January 1976, he married Joan Sullivan at Holy Trinity in Georgetown, and they were blessed with one son, John. His professional career entailed many administrative positions. His publications include research studies at New York University and the George Washington University, monograms in special education, many articles in religious journals (e.g., America, the Beacon, CORPUS Reports) and a book, Married Catholic Priests (New York: Crossroad, 2005). StreamSend, the email marketing service provider, has announced that StreamSend Smart Video is now available to marketers looking to build profitable customer connections with the unique reach and high impact of video emails, easily turning any existing YouTube video into an email marketing piece customized for viewer action. More than 1 billion unique users visit YouTube each month, 50% of users watch business related videos on YouTube once a week, and 75% of users visit the marketers website after viewing a video those are some powerful stats for marketers, said Dan Forootan, president of StreamSend Email Marketing. With StreamSend Smart Video, we are giving marketers the ability to tap into that power, easily customizing existing YouTube videos to drive action, response and relationships. We can help them make their YouTube smart. StreamSend Smart Video lets businesses convert and customize their YouTube videos into messages that they can share, email, add call to actions, sign people up, include forms, add play the next video and more. By turning these YouTube videos into active communications, StreamSend Smart Video helps marketers reach customers in their inbox, on social, and on mobile, everywhere they go. And unlike auto-play videos, YouTube offers a user-initiated experience that has been shown to create superior engagement. With StreamSend Smart Video, marketers can engage their audience with content that is relevant, valued and more likely to draw response. Adding videos to email shows a much higher return on investment, increasing ROI and boosting monthly revenue by forty percent. Click-through rates increase 2-3 times when marketers include a video in an email. Subscriber-to-lead conversion rates increase 51% when video is included in email marketing campaigns. See how easy it is to use StreamSend Smart Video and send videos with call to actions, Try This Sample Share. Clicking on the video could send viewers to a share page, like here, or it could take viewers right to your web page or blog to play it there. Find out how StreamSend Smart Video helps businesses easily create YouTube video emails that increase click-through rates, conversions and sales, visit http://www.streamsend.com/VideoInEmail to see a demonstration video and get a free 30 day trial.